This 1 hour webinar with PolarTREC teacher Michelle Brown and the Human Impacts in Antarctica 2015 expedition is now archived here. 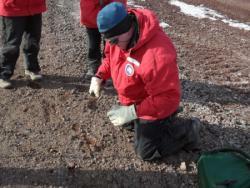 Andrew Klein collects a sediment sample at Arrival Heights, Antarctica. Arrival Heights, Antarctica. Humans have occupied the McMurdo Sound for over a hundred years. Early visitors had little impact on the region, but starting in the late 1950’s year-round, permanent buildings were established at McMurdo Station. Over the years thousands of humans have visited this area and have changed the landscape. Under its obligations to the Antarctic Treaty, the United States maintains a long-term monitoring program designed to track the environmental conditions in and around the station. Each year, the research team conducts environmental monitoring and chemical, physical, and biological sampling in and around McMurdo Station. They collect samples from both marine and terrestrial habitats as measures of human impact. They take the samples back to the lab to look for contaminants. The results of this research help document and minimize the impacts of future science and support operations in Antarctica. This information can be used to inform management decisions in and around McMurdo Station to help preserve the unique Antarctic environment. Learn more about this project by visiting the official project website: Island to Ice. 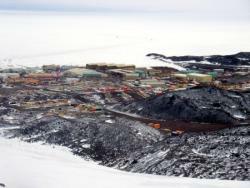 A view of McMurdo Station from above at the former grounds of the nuclear power plant. Looking out over the harbor and McMurdo Sound, Antarctica. The research team was based out of Crary Laboratory at McMurdo Station, Antarctica. McMurdo is located at the southern tip of Ross Island on the shore of McMurdo Sound. During the summer research season, McMurdo hosts the largest community in Antarctica, supporting up to 1,200 people. The team made day trips by foot and truck from McMurdo Station to their various marine and land sampling sites. This 1 hour webinar celebrates Antarctica Day 2015 with PolarTREC teacher Michelle Brown and the Human Impacts in Antarctica 2015 expedition. Michelle and her team are on the ice, at McMurdo Station, sharing their research project with the webinar audience. Michelle is excited to return to the ice for a second time with the research team! Michelle is a former middle and high school science teacher and math/science instructional coach. She currently does consultant work in equity in education and is a remote curriculum specialist, while raising her 1 year old daughter. She plans to pursue a degree in equity in science education upon returning from Antarctica. Dr. Andrew Klein is a professor in the Department of Geography at Texas A&M University. He received a B.A. from Macalester College and a Ph.D. in Geological Sciences from Cornell University. He applies Geographical Information Systems (GIS) and remote sensing techniques to examine the impact of humans in and around McMurdo Station, Antarctica and other aspects of the Cryosphere. Andrew's role is team leader and GIS specialist. Stephen Sweet is a geochemist from the Geochemical and Environmental Research Group at Texas A&M University. His research interests have focused on environmental monitoring and assessment. He has participated in a number of scientific research programs in Antarctica, with multiple deployments to both the Antarctic Peninsula and Ross Island investigating the spatial and temporal patterns of human disturbance. Steve's role on the project is analytical geochemistry. Terry is a Research Associate who specializes in studying the effects of humans on marine and estuarine environments, especially the benthos (organisms on the sea floor). He been involved in marine and terrestrial environmental monitoring in Antarctica for 11 years. Terry's role in the team is a benthic ecologist and scientific diver. Carl Green is currently a Geography Masters student at Texas A&M University. He earned a B.S. in Geographic Information Systems from the University of Oklahoma. Carl will assist the project with field sample collection and GIS analysis. Thank you so much Janet! I feel so lucky to have had the chance to work with this amazing team twice! !